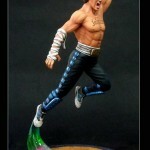 Brown hair, Green Shadows, and lots of attitude, Syco Collectibles present to you: Mr. Johnny Cage! One of MK’s most iconic and enduring characters, Johnny Cage charmed his way into our hearts as he found himself, his path and his true calling within the legendary Mortal Kombat Tournament! Along side his friend and Chosen Warrior, Lt. Sonya Blade, the adventurous movie star is left as one of the few survivors during Shao Kahn’s unholy invasion of the world. Shinnok has emerged from the Netherrealm, but, Johnny is more than ready to “Shadow Uppercut” the upcoming forces of evil that threaten to destroy all of that he loves and stands for. They’re gonna get Caged! You can preorder him here. 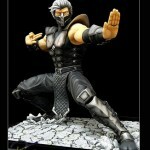 Sycocollectibles has brought to us Mortal Kombat Smoke 18″ Razor Edge Collectibles Exclusive Statue. Originating from Prague, Tomas Vrbada was only a boy when he was abducted and sacrificed by an obscure cult. He returned as a creature of smoke and vapor and assumed a new human form, unaware of his true identity for many years. Sycocollectibles proudly presents to you their 18″ statue of the enenra himself! The Exclusive version of Smoke will feature 2 interchangeable heads: one featuring his well known iconic primary costume from MK9, and the other featuring the mask of his alternate costume. Their Exclusive Version will be available only through Razor Edge Collectibles! Notice Smoke’s trademark finger-pose as he gets ready to vaporize you. The elusive warrior has been captured. 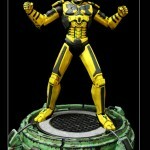 Syco has updated their Mortal Kombat – Cyrax 18″ Premium Format Statue. The last time we saw Cyrax, he was still in the early sculpting phase. Now they have a full realized sculpt. Cyrax will come with an additional set of arms creating an alternate pose. His chest plates will be removable and will reveal his light up chest just before his bomb is deployed. There will be an assortment of LED’s on him and we think this will be an awesome collectible. We have just started the Paint Master and this should be ready before the end of this month (and ready for Pre – Orders). We anticipate the release date for this statue will be around Jan/Feb 2013. 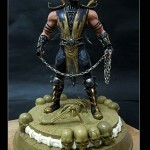 Syco has posted a new gallery and info for an upcoming Mortal Kombat 18″ Scorpion Exclusive Premium Format Statue. Check the details below. We are proud to present you with the first images of our Exclusive Scorpion 18′ Base! The sculpt has been completed and it is now being made into a protoype. We should be able to show you the full finished painted base in the next few weeks. Please, make sure to write ‘Scorpion PF Exclusive Upgrade’ in the subject and make sure you give us your Name and/or Order No. We hope you that like the base and thank all our customers for their continued support. Syco has sent along a bunch of new photos and info for their upcoming Mortal Kombat Sindel 10″ Statue. There will be both a standard and an exclusive version. Check the info below. Syco Collectibles are proud to bring you the Queen of the Mortal Kombat world. Beloved by Kingdoms and destined to become a most noble and mighty ruler, Queen Sindel met a tragic end as she sacrificed herself for the protection of Earthrealm. Her suicide created a powerful barrier that prevented Shao Kahn from invading our world. However, with the aid of unspeakable dark sorcery, the Emperor resurrected and enslaved the Queen’s body, mind, and soul to obey his poisonous will. Once a hero and defender of peace, Sindel is now a deadly threat to the very existence of the realms. Made from cold cast polystone resin this beautiful statue stands 15.5′ tall from the bottom of the base to the top of her head. Each Statue is individually painted and finished, each with its own unique quality and detail. Each one comes with a Silver Authenticity Card and full color packaging. 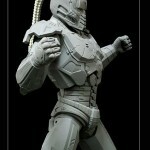 Made from cold cast polystone resin this Exclusive Version features a pair of switch out arms giving you various poses. This beautiful statue stands 15.5′ tall from the bottom of the base to the top of her head. Each Statue is individually painted and finished, each with its own unique quality and detail. Each one comes with a Silver Authenticity Card and full color packaging. Premium Format Statue. 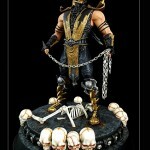 The Mortal Kombat Assassin with his Fatality move, having ripped the the head and spinal cord from Scorpion. Cast in high-quality polystone and hand painted, this outstanding 18′ (from base of foot to top of head) Statue comes on a 1.5′ base and stands an impressive 19.5′ tall. 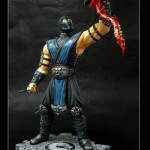 The Statue comes with Light up eyes in both Sub Zero’s and Scorpion’s head. Also it comes with a switch out hand that holds part of Scorpions costume. Each Statue is individually painted and finished, each with its own unique quality and detail. Each one comes with a Gold Authenticity Card and full color packaging.